I loved them as a kid. When I began to hear rumors about what was actually in them-and then could actually find out on my own, I stopped eating them. Did I mention that I loved them? What a savory, deliciously cruel joke to include the sweepings up of the slaughterhouse floor. I could get over the ground-up animal remnants, assuming it isn’t pink slime and something a little more honest and lacking added amonia, etc., even if it is “a small amount of amonia gas” added to the meat separated from animal fat via a centrifuge then encased in a (natural or artificial) casing. Better living through chemicals…I’m not entirely comfortable with that, even if it might be acceptable to the industry, elected officials and their scientists. Using as much of the animal as possible is just efficiency. I’m probably going to shoot myself in the foot regarding this issue too since it might just be too difficult to separate a product that people love to eat as much as a hot dog from this process in our modern America, unless you buy the ‘specialty’ product that costs more, but doesn’t happen to ‘mechanically separate’ the meats. In other words, it may practically be inevitable that you will consume such things in America – unless you are a vegetarian/vegan. After all French cuisine isn’t necessarily famous because it is so extravagant while using the best possible cuts of meat. It is famous for making something famously extravagant by using the least popular cuts or, in general, the left over scraps. Thus taking something that cost a franc and turning it into something that tasted like a million francs. Maybe I am giving away too much about my occasional childishly unrefined tastes, but I also happen to still appreciate bathroom humor too. So, now that I’ve laid my cards on the table and you know more acutely about who your author is, let’s return to lunch. Weather and other responsibilities aside, I didn’t think it best to be in the house today, but with very few errands to run and a napping son, I stopped at my favorite cafe/Conditorei for a quiet moment with good simple coffee. When my son awoke, I ordered him a pair of Frankfurters (or general wursts), that is literally what the menu said. The pair of Frankfurters was offered with two thin slices of bread, plain mustard, and garnish of a leaf of basil, a portion of tomato and a slice of cucumber (which was probably meant to represent the ‘salad’). I broke off a piece of Frankfurter and peeled off the skin, or casing before my son promptly grabbed it from me, devouring it like the meek starving child he is*. It was during this rabid consumption that made me recall my own American childhood and media. Kids love hot dogs, just don’t ask them (or tell them) what is in them (at least in America). So, that got me thinking, what is in these Frankfurters? I know Germany has its “purity laws” regarding beer called Reineitsgebot but what about it’s wursts and weiners? Yet since I don’t really speak German, how do I really know what is in my food? Honestly, it is important to decipher the labeling, just as you should in America. Unfortunately for America, more information isn’t on the label. I personally wish GM foods & ingredients would be labeled, but that is just me. I also think that the portion sizes and the nutritional facts listed in conjunction with them should also be a more accurate and honest refection of what the ‘average’ person in the US eats. For example, are you really onlygoing to eat six or eight chips from a bag as a portion with your lunch or as a snack, really?! “Food purity laws hold a revered place in the German soul. When the modern German nation was formed in 1871, Bavaria joined on condition that its beer purity rules be applied to the entire country. Even today, spoiled meat outbreaks are a national scandal and consumer protection is considered among the most important functions of government. While this article is mainly about Bavarian purity laws, since it was a stipulation of unification that the laws be nationwide, I don’t see how this can’t also apply to a Frankfurter. But, I have been wrong before. However, on further perusing of the web, I came across the Regulation (EU) No 231/2012 on the European Commission’s website which stipulates that, “Food additives must comply with specifications which should include information to adequately identify the food additive, including origin, and to describe the acceptable criteria of purity. ” The website clearly identifies the rules and regulations with regard to the whole of the EU in relationship to food purity and ingredient identification. Emulsifiers to maintain the mixture of oil and water in a foodstuff. Added to food for technological purposes in its manufacture, processing, preparation, treatment, packaging, transport or storage, food additives become a component of the food. EU legislation describes 26 different technological functions. Thinking about all of this really made me curious about the difference between a standard hot dog and Frankfurter. I knew I could find American manufactures food information online, but possibly not German. I thought I would just compare ingredients listed, since much of the other information doesn’t make sense to me (although I’ve been figuring it out). As far as calories, fat and other notable information that is usually on the nutrition label, if I am eating something from a store like a hot dog or sausage, I always assume the wurst. Ha, walked right into that one didn’t ya! So, I am using Oscar Mayer classic hot dogs as the ‘American’ example here. Really only because that is what is on my brain at the moment (see classic commercial above for reference). And unfortunately, this is a layman doing ‘research’, not an actual scientist – so I know my method is flawed. 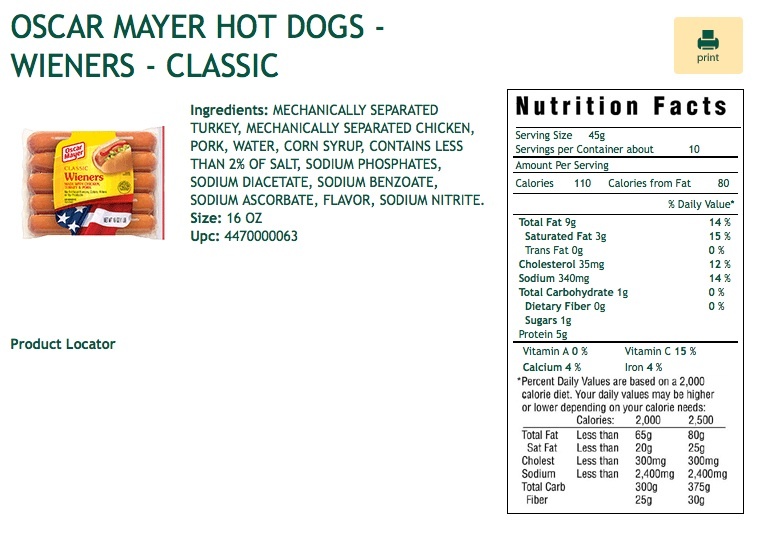 This is a screenshot of the ingredients and nutritional information for the “Oscar Mayer Hot Dogs – Weiners – Classic”. The original can be found here, especially since they offer other options of hot dogs that may be healthier. 80% pig meat, drinking water, iodized table salt, spice extracts (pepper, onion, chili, mace, nutmeg, cardamom, coriander, ginger extracts), sugar, stabilizers: diophospate, antioxidant: ascorbic acid, conservative: sodium nitrate, sheep casing, beech wood smoke. May contain traces of soy protein, mustard, and celery. *Reference quantity for an average adult ( Based on a 2000 calorie diet). One portion equals one wurst, which is more realistic than American packaging – a plus! Condensing: I’m not sure what this is. I imagine it has to do with total calories from 100 grams, which should roughly be two wurst. So, one wurst should equal 122 calories. Fat: There is 10.5 grams of fat in each wurst. Apparently this is equal to 6% of an adults daily intake, which is equal to 15% of an adults total daily intake. – from saturated fatty acid: 4.2 grams of saturated fat in each wurst, and 21% of an adults total daily intake. – from sugar: This is actually the same as the carbohydrate information, so I gather that the carbs are from added sugar. Perhaps more importantly there is less than one percent of the average adults general intake. Protein: Each wurst seems to have 6.5 grams of protein – I guess this is equivalent to 13% of an adults general daily intake. 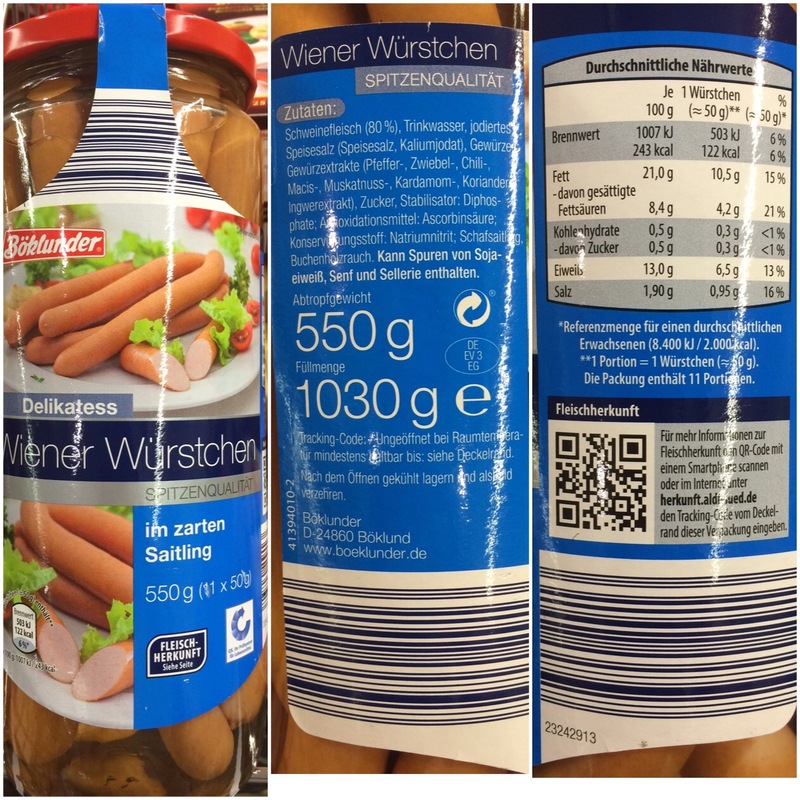 Salt: Finally each wurst contains .95 grams or 16% of an adults general intake of salt. Is it strange that after translating the packaging I feel like I understand it much better than American packaging and dietary information. At least this German label seems to make a bit more sense than its American counterpart. These types of German wursts seem to be generally popular here in Germany, but they are incredibly salty. We keep a container on hand to take with us to the zoo or on a day trip, but otherwise rarely eat them.